Overview - Mike is a law student who has once been burned playing poker, and has turned his back on gambling in order to settle in with his girlfriend Jo, and his studies. When his former partner in crime Worm is released from prison, though, he is tempted back to the card tables and realises how much he enjoys the thrill of gambling. Jo leaves him, and he goes on a poker spree with Worm, in an attempt to recoup a debt that Worm has carried over from before prison. The men to whom Worm owes the money get heavy, and Mike is forced into a showdown with Teddy KGB, the hood to whom he lost his life savings a year before. Though we can try to hide from ourselves, in the end, we can't ever truly escape who we are. At some point, whether we embrace them or not, the natural impulses buried deep within our very DNA will escape, and though that freedom often causes great relief, it almost always comes tied to heavy sacrifice. In the 1998 film 'Rounders,' the impulses in question are those to live life on the wire and risk it all, and the potential sacrifice might end up being love, stability, and well, maybe even life itself. Focused on the alluring world of underground poker, the movie weaves a high-stakes tale of friendship, danger, and the struggle to embrace one's true calling in life. Filled with strong performances and captivating subject matter, the film manages to rise above some predictable and conventional scripting, to form an entertaining and worthwhile experience. 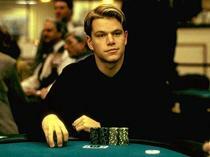 The story follows a law student named Mike (Matt Damon) who also happens to be an exceptional poker player. Entrenched in the seedy yet seductive world of illegal gambling, he ends up betting his life's savings in an underground match. Though it looks good at first, the poor man ultimately loses it all and becomes so rattled by the defeat, that he decides to retire from the game to focus on other professional and personal pursuits. That is, until an old gambling buddy with a penchant for trouble, "Worm" (Edward Norton), is released from prison and gradually rekindles Mike's passion for cards and high-stakes living. Eventually, "Worm's" poor choices lead the two best friends into some truly precarious waters, and the pair of poker players must figure out a way to come up with a large sum of cash in order to avoid the wrath of a dangerous Russian mobster (John Malkovich). The plot itself is fairly straightforward, and the screenplay adheres to a pretty standard, by-the-numbers structure. The conflicts are all easily laid out, and the characters are clearly defined. This isn't necessarily meant as criticism, as the script is very solid, but the conventional approach does lead to a mostly predictable experience that lacks any real twists or turns. A frequent voice-over narration from Damon's character is also slightly problematic. Though the narration does a good job of placing us within Mike's head, and serves to provide some important insight into the character's actions and poker strategy, some of it can come across as a little over-written and superfluous. It may be an easy way to explain the intricacies of the game to the audience, but the problem is that it can feel a little too deliberate. With all that said, what really makes the screenplay standout, is its interesting and entertaining peek into the life of underground poker. The writers did a fair amount of research into the fascinating world of gambling and while clearly sensationalized, there is still a nice level of authenticity to the proceedings. The jargon, strategies, and mannerisms used by the characters are all true to life and provide a fun look into a culture that many are probably unfamiliar with. Outside of the superficial allure of illegal gambling, the core of the film rests on the performances of Matt Damon and Edward Norton, and the relationship between their characters forms the thematic backbone of the movie. Mike's struggle between the life he knows he should live, and the life he knows he must live, is handled very well. Damon does a great job of wrestling between a sense of responsibility and a desire for freedom, and wisely never overplays the character's struggle. Though his relationship with his girlfriend (played by Gretchen Mol) is a little underdeveloped, it serves the story well, and Mol is a great representation of the sweeter, simpler world that Mike is simply unable to commit to. As "Worm," Norton provides a great mixture of likeable charisma and low-life unreliability. Though it would be easy for the character to come across as completely unsavory, thanks to the actor's performance, he always seems to retain a shred of decency. The way both Norton and Damon play off each other, and the way their characters clash, presents the script with its emotional core. In the commentary track, the filmmakers draw parallels to Scorsese's 1973 classic 'Mean Streets,' and there are indeed strong similarities between their relationship and that of Charlie and Johnny Boy. In a way, their juxtaposing friendship is a staple of fiction itself, and while "Worm" clearly brings Mike down by becoming the main source of almost all of his problems, Mike simply can't abandon him for the pure and simple fact that he cares about the idiot. This leads to a sometimes thoughtful examination of the concepts of loyalty and friendship that all help to elevate what could have otherwise come across as a purely straightforward poker flick. Despite the great chemistry and strong characterizations, their storyline does end rather abruptly, and Norton's character just sort of disappears. While his exit from the plot makes sense, it leaves their arc feeling a little unfinished. Director John Dahl utilizes an assured but not overbearing visual style. Compositions are slick and exciting, by placing emphasis on the strong production design that's seeped in warm, rich colors. The poker games themselves make up a large chunk of the running time, and Dahl presents these sequences in an interesting but slightly restrained manner. In the special features, the director discusses his desire to refrain from dressing up the scenes with too many flashy camera movements or quick cuts. These comments are a bit odd, however, as in some instances he actually does exactly what he says he wanted to avoid, with some energetic spinning and panning shots. Thankfully, these choices don't overpower the scenes and instead work well to help bolster the excitement. On the other hand, other examples are indeed more in line with the director's statements, demonstrating a level of moderation throughout. 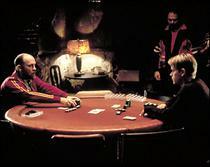 In fact, the focus in the poker games isn’t really placed on the actual cards or hands, but rather the players. Facial expressions and potential tells are emphasized, and a sometimes straightforward approach gives the games a more raw, honest feel. Though not exactly a directorial triumph, Dahl does do an effective job of translating the material in a fitting and occasionally stimulating manner. 'Rounders' isn't perfect by any means, but beneath its somewhat conventional scripting and slight narrative stumbles, is an entertaining and fun flick with strong performances and interesting subject matter. At least partially responsible for a surge in the game's popularity, the picture really gets down to the core of what makes poker, and gambling in general, so appealing. With big risks come big rewards, and while the movie could have taken some greater chances, the end results are still very solid. 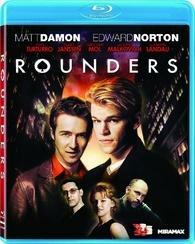 'Rounders' is brought to Blu-ray by Lionsgate on a single BD-50 disc housed in a standard case. Some skippable trailers play upon startup before transitioning to a standard menu. The packaging indicates that this release is region A compatible. The movie is provided with a 1080p/AVC MPEG-4 transfer in the 2.35:1 aspect ratio. With its slick visuals and vibrant palette, the film looks fantastic on Blu-ray. The source print is pristine, displaying a thin, natural layer of grain throughout. Detail is great, showing off the various rough textures of the numerous poker clubs, from the seedy players' wrinkles, right down to the tiny fibers of the cards themselves. Many sequences also feature an impressive sense of depth, that show off nice levels of dimensionality within the image. Colors are bold and rich, with the cinematography emphasizing yellows and reds for a warm and seductive visual scheme that reinforces a stylized but not over-the-top look. Black levels are inky and contrast is strong without being blown out. 'Rounders' has an impressive looking transfer that is free of any technical hiccups. The vivid colors and sharp clarity all make for a pleasing and respectfully authentic film-like experience that should make fans very happy. The film is presented with an English DTS-HD Master Audio 5.1 track. Optional English, English SDH, and Spanish subtitles are included. Though not as impressive as the video presentation, the audio mix is also very good, adding a strong but not quite exceptional level of immersion. Dialogue is full and clean sounding with no audible crackles or pops. Directionality and surround use are both good, with some appropriate effects, ambiance, and music cues being sent around the soundscape, creating a fairly engaging and enveloping experience, especially during the card games. The chatter and commotion of the gambling halls and the bustling life of New York are all brought to life in an authentic aural presentation. While not particularly bombastic, dynamic range and bass do have some welcomed kick, and serve to enhance the drama of some of the more tense sequences. Balance between all of the elements is handled well and thankfully the dialogue is never swallowed up. Though not completely immersive or particularly memorable, the mix does a very good job of opening up the film in an exciting and technically proficient manner. Lionsgate has included a decent but somewhat lacking collection of special features, including two commentaries and some featurettes. All of the supplements are presented in standard definition with Dolby Digital 2.0 sound and no subtitle options. Audio Commentary with Director John Dahl, Screenwriters David Levien and Brian Koppelman, and Actor Edward Norton - All four participants provide a pretty informative and entertaining discussion on the film. The writers share plenty of tidbits on the origins of the script and how the story evolved over time, and John Dahl gives some details on locations and his stylistic choices, particularly his desire to hold back from visually over doing the poker scenes. Edward Norton serves to guide the discussion from time to time, asking specific questions, and points out the many amusing lines of dialogue that he actually improvised. All in all, this is a solid track that is worth a listen. Audio Commentary with Professional Poker Players - While I wasn't expecting much from this track, considering the participants have little to nothing to do with the actual movie, it isn't quite as pointless as I thought it would be. Professional poker players Johnny Chan, Phil Hellmuth, Chris Moneymaker, and Chris "Jesus" Ferguson all offer comments throughout the movie. The players mainly focus on analyzing the poker strategies of the various characters and point out choices and events that seem authentic and others that seem a bit unrealistic. There are a lot of gaps in the conversation, however, and for the most part this just feels like a group of friends sitting around watching a movie they like while occasionally making jokes and observations. Though not very informative, there are a few interesting insights into the actual game, and big fans of poker may enjoy listening to the pros. Behind-the-Scenes Special (SD, 5 min) - This is a very brief promotional behind-the-scenes look at the film with some quick cast and crew interviews and on-set footage. The participants discuss some of the real world inspirations behind the story, elaborate on the poker terminology used, and spend ample time complimenting one another. Though mostly fluff, there are few interesting bits thrown in. Inside Professional Poker (SD, 6 min) - The actual world of professional poker is the focus here, with cast and crew, and professional poker player interviews. The participants analyze the game and discuss the strategy and business aspect of the profession. We also get a look at the actors' preparation for their roles which involved a lot of actual gambling and even led to them playing in the World Series of Poker. Champion Poker Tips From Four Professionals (SD) - Johnny Chan, Chris "Jesus" Ferguson, Phil Hellmuth, and Chris Moneymaker all provide some brief tips on the game. The tips are separated by player and topic in their own branching menus. In a rather annoying omission, there is no "play all" feature, so you must individually select each tip from each player one at a time. This wouldn't necessarily be an issue, but most of the separate tips are actually only ten to twenty seconds long, so it seems rather silly not to just play them in one batch. Each player has about one to three minutes worth of tips but unfortunately the information provided is really basic and superficial, covering such mind blowing ground as "taking the game seriously," and "making sure to always raise." Basically, this is pretty useless. 'Rounders' is a solid and interesting look at the intriguing, compelling, and sometimes dangerous world of poker. While the script doesn't always succeed, the talented cast ensures an entertaining ride. The video and audio quality are both great, but the supplements are a little lacking. Still, this is a strong disc that comes recommended.